Roman Lorica Armor for sale weighs 25 pounds. Roman Lorica Segmentata like this one was a type of medieval armor that was used by the military of ancient Rome. This contemporary version is authentically styled and made with 18 gauge steel. It will fit up to a 44 inch, over garment, chest size. The fittings are crafted of brass. 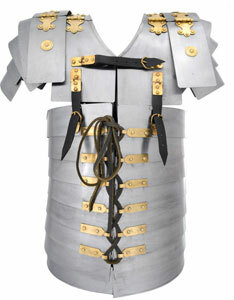 Buy the Roman Lorica Medieval Armor for $229.99.